I never thought I'd be here writing about TV Land's "Hot in Cleveland" but leave it to Comic-Con to change this fact. 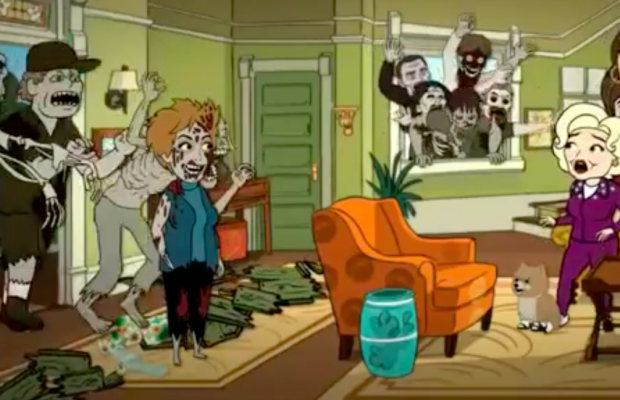 A preview of the July 30 episode of what is being titled, "The Animated Episode" debuted during the “Legends of TV Land” panel at San Diego Comic-Con and well...there are zombies. From TV Land, "Our ladies go 2-D in a fun-filled animated episode that involves questionable beauty treatments, zombies, and a look at Cleveland had LeBron never left." The ladies are their usual selves even with the zompoc raging outside their door. Unfortunately for Elka's sister, Mamie (Georgia Engel), her kindness gets her gnawed during the homage to "The Walking Dead." The plethora of pop culture episode airs on Wednesday, July 30, at 10 p.m. ET on TV Land. Check out the peek below and thanks to Bloody Disgusting for the tip on this cool episode.